Skirt steak has so much flavor - if you like beef, this is for you! It is without a doubt our family and friends favorite. Plan ahead, the steak needs to marinate at least four hours or overnight. The salsa verde can be made ahead. Another reason to love this dish, it can be made ahead of time, all you have to do is grill the meat. Combine the rosemary, thyme, parsley, garlic and olive oil in nonreactive medium casserole. Stir well to blend. Place the steak in the casserole and turn to blend both sides with the herb mixture. Cover and refrigerate for at least four hours or overnight. Preheat the grill or broiler. Remove the steak from the marinade, and season with salt and pepper. Place on the hottest part of the grill, cook for 3 minutes on one side, then on the other side for 2 minutes. Let the meat rest for at least five minutes before slicing(on the bias) about 1/2 inch thick. I like to place the sliced steak on a platter family style, and the salsa verde sauce (recipe below)in a small bowl. Family and friends can help themselves. I have to omit the anchovies for my son and daughter, they haven't acquired a taste for them (yet)! It still takes great, so I don't mind. 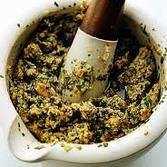 In your food processor, pulse/chop the parsley, basil, mint, garlic, capers and anchovies until roughly blended. Transfer to a large bowl and add the vinegar. Slowly pour in the olive oil, stirring constantly, add the mustard. Check for seasoning, you might not need salt, just pepper. heuer watches, omega watch copy, cheapest fake rolex, omega. For the free gift card generator is on http://freecodesmarket.com/ for free.